Photo courtesy of The Greeley Tribune. 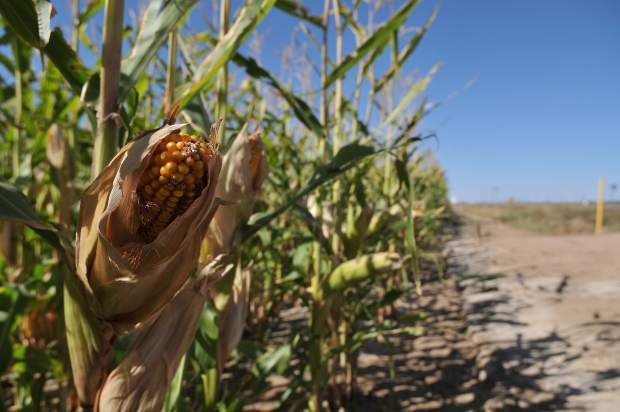 Many area corn farmers are facing reduced water supplies for irrigation this coming season. Two proposals for coping with drought and short water supplies are to cut planting population rates and to plant shorter season corn. In this news column, I’ll discuss the effectiveness and practicality both of these practices for reducing water stress in corn during drought. Research on crop water use in corn has determined that the maximum rate of evapotranspiration (or crop water use) is reached when the total leaf area of the crop is 2.7 times the soil area that all plants in a given area cover. High corn populations reach this level quicker than that of lower plant populations depending on the corn variety and optimum growing conditions. In some very low plant populations this leaf area index is needed to keep corn plants viable in the absence of irrigation. Colorado State University research on limited irrigation corn has found that under optimum growth conditions one has to drop the plant population to 18,000 to 22,000 plants per acre before evapotranspiration is reduced, depending on variety. However, substantial water conservation is only achieved by dropping the population to 10,000 to 12,000 plants per acre. Dryland producers in the dryer areas of Colorado’s High Plains Region typically plant corn at these lower population levels. Lower plant populations can work to reduce crop water consumption and optimize yield during drought. However, they also limit the upside yield potential should fields get timely rainfall during critical pollination and early grain-fill growth stages. Furthermore, there are no crop insurance instruments for limited irrigation cropping systems. They are only written for full irrigation or dryland irrigation. Insurers may insure for dryland cropping if farmers are not seeding at optimum planting rates. Using shorter season corn varieties can also reduce the risk of crop failure during drought. Longer season corn varieties have higher yield potentials but because they need more water using days to full maturity they also use more water. One study found that a 98-day hybrid produced 180 bushels per acre and used 26.5 inches of water, while a 115 day variety yielded 211 bushels per acre, and used 31.6 bushels. The short-season variety had a slightly better water use efficiency: 6.8 vs. 6.7 bushels per acre per inch of water used. Planting shorter season corn varieties can reduce water use but once again these tend to limit the upside yield potential with fortunate rainfall during the reproductive growth stages. I have to add that some of our short season corn varieties still have the capability of producing high yields (270 bushels harvested from one test site using a 102-day hybrid). Check with your seed representative for the yieldability on their line of short season corn. If you know one or more of your fields are short on irrigation water, CSU Extension recommends that farmers split their production between full population, appropriate corn varieties on some or parts of fields and plant lower water use crops or cropping rotations on the remainder. Contact your local Extension agent for alternate crop recommendations.